KX-TDA100D, adalah PABX Panasonic dengan teknologi digital terbaru yang diciptakan melalui riset & survey market yaitu pengembangan dari kxtda100 sebelumnya yang berkapasitas hanya 5 Slot, Kini KX-TDA100D berkapasitas s/d 7 Slot . Di Awasi ketat oleh pihak Panasonic Riset and Development team, PABX System KX-TDA100D ini memiliki Built-in power supply dan Built-in 4 Port Digital Ext. Apakah manfaat dari “Built-in” Feature tersebut? Berdasarkan riset customer atau pengguna PBX di Asia khususnya Indonesia ternyata memiliki perhatian yang lebih pada harga, dengan “Built-in” Feature ini jelas customer dapat lebih menghemat biaya yang harus dikeluarkan, baik dari saat awal pembelian hingga suatu saat nanti harus meng-upgrade system ini untuk pengembangan kedepannya ( Future Raedy Expandability ). KX-TDA100D menawarkan solusi wireless, voice mail, small call centre, integrasi telpon selular dan memiliki jangkauan jumlah ekstensi yang cukup luas 16-128 ext dengan tanpa merubah power supply nya karena sudah mencukupi kebutuhan daya keseluruhan sejak awalnya, di samping 8 Built-in Digital port DXDP feature nya juga disiapkan sesuai dengan kebutuhan umum pengguna Digital PBX di Indonesia, mengingat umumnya pengguna hanya membutuhkan kurang dari 8 port. combining the benefits of traditional telecommunications with the advantages of contemporary IP technology, Panasonic’s KX-TDA100D Hybrid IP-PBX System Reprovides the features and flexibility to handle all of your corporate communication needs – both today and in the years ahead. Incorporating an impressive array of advanced corporate telephony functions in a cost-effective package, the IP-enabled KX-TDA100D offers a wide range of capabilities to optimise your company’s communications. Solutions such as Wireless Mobility give you the freedom to respond to important calls when you are away from your desk or moving around the office, while advanced call centre functions make it easy to distribute calls, manage agents handling calls, and control internal use of the phone system, improving communication efficiency and allowing you to serve customers more effectively. Designed to accommodate your business as it grows, the IP-Enabled KX-TDA100D allows you to connect up to 128 single line telephones. That number can be further increased by adding DEeT wireless handsets. Taking advantage of the simplified, streamlined communications and enhanced productivity made possible by IP telephony is key for any forward-looking business. 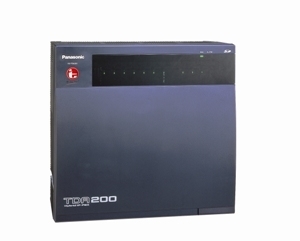 The KX-TDA100D is IP-enabled, providing a flexible IP network infrastructure that can carry both voice and data communications. Versatile modular architecture supports IP convergence, allowing you to migrate to Voice over Internet Protocol (VoIP) at your own pace. By enabling voice and data communication to work within the same network, IP telephony increases network utilisation and reduces infrastructure cost. The KXTDA200 is a hybrid IP PBX system to fulfil customers requirements today and into the future. It can be configured to meet their present needs and expand as their applications grow or change. The KXTDA200 is a next generation product, combining PBX reliability with IP technology offering efficient and flexible communication. The KXTDA200 cost effectively bridges the gap between the telecom requirements today, and the demand for future integrated solutions. The New KX-TDA600 is a hybrid IP PBX system to fulfil customers requirements today and into the future. It can be configured to meet their present needs and expand as their applications grow or change. 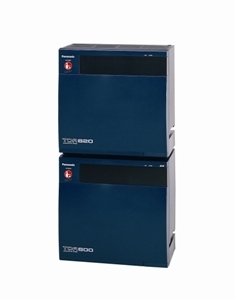 Plus, with the KX-TDA600’s free slot architecture, you can easily insert expansion cards and access new features as well as expand your capabilities.Packed with features the KX-TDA600 is ideal for so many different applications. These include hospitality, call centres, remote users and IP networking. It also allows for greater efficiency, with DECT and IP handsets can provide mobility and flexibility around the office, site or network. The KX-TDA600 can also integrate with the KXT-VM voice range with integrated email delivery.Utilising the gateway and extender or IP handsets, homeworkers and remote branches can access the features of your central communication platform. Built on twenty years experience of developing business communications technology, the top of the range hybrid IP PBX KX-TDA600 works seamlessly with IT, and combines voice and data in one low cost next generation Hybrid solution.